One chicken -- four meals!!! Four meals for two, that is!!! We get the best chicken here on the prairie from Gannon Family Farms. And their chicken is not just chicken but a treat!!! 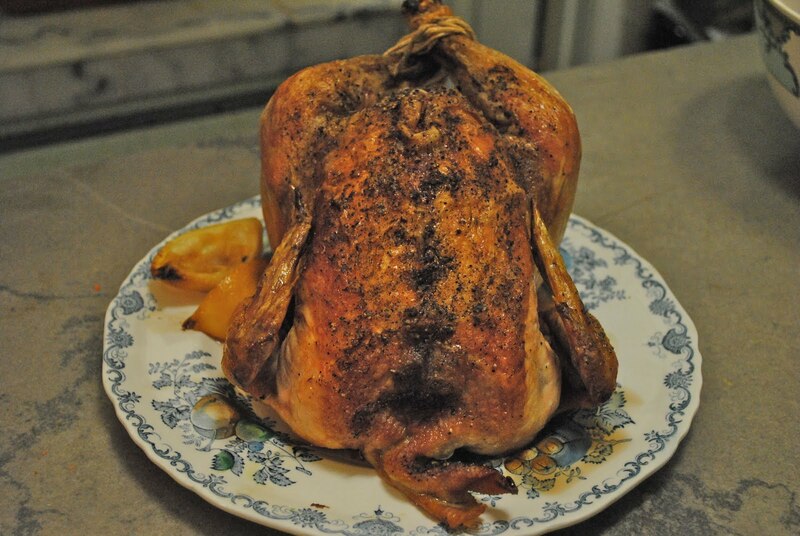 We love roasted chicken and Ina Garten's Lemon Roast Chicken is one of the best recipes for roasted chicken. Meal One: Ina Garten's Lemon Roasted Chicken (served with Brussel Sprouts sauted with bacon and finished with balsamic vinegar) and herb roasted onions. A comfort meal for a coolish fall night. Meal Two: A cold roast chicken lunch. A favorite of ours -- a joint of chicken and a salad with Linderhof vinaigrette. Some bread and butter if we have it. Chicken Pot Pie. A favorite of Husband Jim. It makes for a great dinner and no one would suspect it was leftovers! My recipe is a bit of a "cheat" -- it's simple and goes together quickly. But it has great eye appeal and great flavor and everyone I've served it to thinks that it's quite yummy! Meal Three: Next night dinner. Chicken Pot Pie, a green tossed salad with Linderhof vinaigrette and a hot poppyseed roll. Meal Four: Lunch the next day -- the remaining two pot pies. 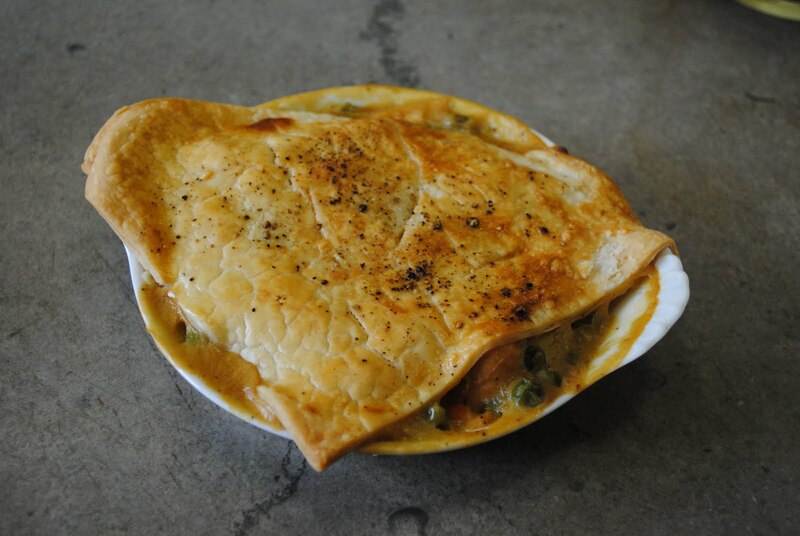 Served simply -- just a pot pie and a big glass of iced tea for lunch! Fresh raspberries with a shower of sugar and a pour of cream! It's Friday so that means it's time to join Michael at Designs by Gollum for Foodie Friday! Take the giblets out of the chicken and wash it inside and out. Remove any excess fat and leftover pinfeathers. Toss the onion with a little olive oil in a small roasting pan. Place the chicken on top and sprinkle the inside of the cavity with salt and pepper. Place the lemons inside the chicken. Pat the outside of the chicken dry with paper towels, brush it with melted butter and sprinkle with salt and pepper. Tie the legs together with chicken string and tuck the wing tips under the body of the chicken. Roast for 1 1/4 to 1 1/2 hours or until the juices run clean when you cut between the leg and the thigh. Cover with foil and allow to sit at room temperature for 15 minutes. (The onions may burn but the flavor is good). Meanwhile, heat a large saute pan with 2 T olive oil until very hot. Lower the heat to medium low and saute the bread cubes, tossing frequently until nicely browned 8 to 10 minutes. Add more olive oil as needed and sprinkle with 1/2 teaspoon salt and 1/4 teaspoon pepper. Place the croutons on a serving platter. Slice the chicken and place it, plus all the pan juices, over the croutons. Sprinkle with salt and serve warm. NOTE: I did not make the croutons. Just did the Lemon Chicken. Mix soup, vegetables and chicken. Put into an oven proof dish (I used 5 inch gratin dishes). Cut one pie crust into 4 pieces. Place over chicken mixture. Brush with egg wash and sprinkle with salt and pepper. Cut three vent holes in top of pastry. Bake at 350 until golden brown and heated through (about 20 to 30 minutes). I love Ina's Roast Chicken with Croutons. Delicious! Great-looking potpies, too! I first saw Ina's lemon roast chicken on your blog and that's how I've roasted our hens ever since. Love your pot pie! Love your Chicken Story. Fabulous ideas. Martha....Love your chicken story. I make your Pot Pie all the time it is my fave recipe to go to for chicken pot pie..... easy and yummy. Seems you're a step ahead of me. I had thoughts of chcken and dumplings the other day. Thanks for the all inspiring 'comforts of home' post. With our current economy, I'm all for four~in~one! 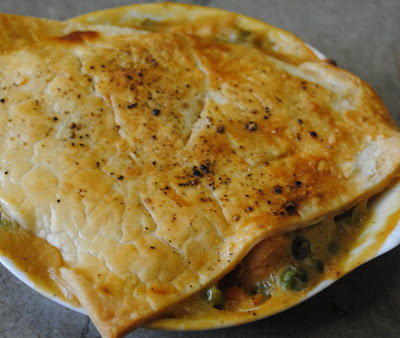 Martha, I love the elegant simplicity of your chicken pot pie method-- thank you! What great recipes - simply delicious! We had chicken so often when I was a kid, but my mother never used it to it's full potential, but I can make a chicken feed an army. Yum, yum. Happy FF.